Yup, It’s hot outside alright and it’s time to remember to hydrate properly. Yes, we all know that we have to drink our water and we don’t always drink enough. Also because America is so addicted to sugars, the beverages of choice are typically chock full of sugars and other bad-for-you ingredients which are damaging to your health. It’s estimated that seventy-five percent of Americans have mild, chronic dehydration and it gets worse in the summertime. Symptoms include sleepiness, weakness, headaches, lightheadedness or dizziness and even fever. I was riding my bike last week on one of those extremely hot days and I knew I was in trouble when I started getting the chills. Thank goodness I was only a few miles away from home! On average, adults lose about 2.5 liters (10 cups) of water a day simply by doing everyday tasks. So, the average person requires between 2 and 3 liters a day to replenish that loss. But higher temperatures will cause much higher water losses. In higher heat and humidity, simple tasks like mowing the lawn, rearranging furniture, gardening or even throwing a Frisbee around at the beach will result in losing as much as a liter per hour! That fluid loss has to be replaced in addition to baseline needs, and ups the usual 2.5 liters necessary to 3 or 4 liters and often more. 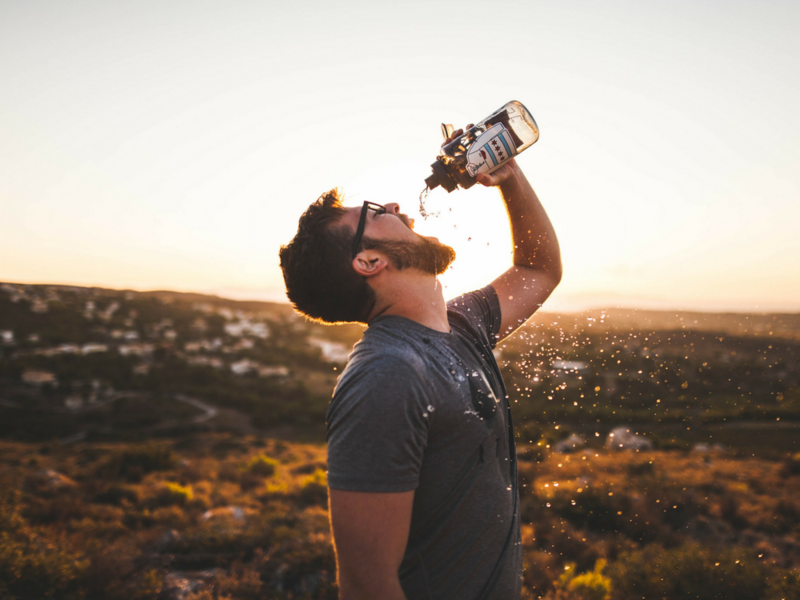 Even those who have adopted a healthy lifestyle of exercise, hydration and healthy eating, may not be aware of the significant extent to which excess heat affects hydration status. Parties, fun in the sun, on the beach or at the backyard barbecue can spell trouble for hydration status because alcohol is a known diuretic, and so are sugary soft drinks. Many people think that because they are drinking fluids, it’s not a problem, making it extremely important to educate patients that sun and alcohol can lead to serious dehydration — before they find out the hard way! Staying properly hydrated, especially in hot weather, requires a conscious effort, and is essential for optimal health. At home, I have two glass 2 liter pitchers I fill each morning with fresh filtered water. One stays on the counter and one goes in the fridge. My goal is to make sure I drink all the water in those two pitchers every day and most of the time I do. Using a straw makes it more fun as well. And if I can do it, anyone can! A frequent complaint I hear from clients is they get bored with water, and want something with flavor. A good alternative to the artificially sweetened “flavor enhancers” in the grocery stores, is to recommend using a splash of freshly squeezed lemon, orange or just fresh fruit along with a pinch of celtic sea salt for the minerals and a pinch of stevia. Add a little ice, and what’s not to like? I know that you are trying hard to live a healthy lifestyle an adequate hydration is number one in importance to life and enhancing our health. You may think you are well hydrated and it’s likely that you are not so make sure you drink pure water every day, all day for a healthy, happy and hydrated summer! P.S. Stay tuned every day this week for Fun Hydration Recipes!! !